Home » Blog » Some Things Just Don’t Belong in the Toilet! Toilets are an amazing thing. They take our most undesirable waste and cleanly dispose of it in the most convenient way. Sometimes, that convenience can be a trap if it tempts us to flush things that don’t belong in the toilet. There are a number of items that can destroy your plumbing if you flush them too often, and yet other products are just bad for the water supply. 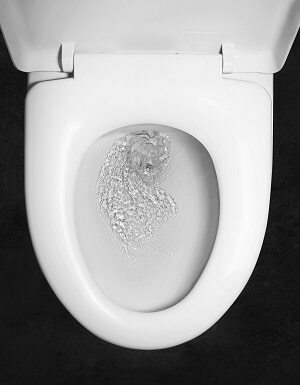 With that in mind, these are the most commonly flushed items that should never be in a toilet. Your first thought with cotton might be clothing, and who would be crazy enough to try and flush that? But, Q-tips, cotton swabs and a number of other hygiene products are all made with cotton. When you flush them, they never break down and dissolve in the water. This makes them prone to coagulation, and if flushed enough, they can completely destroy the drainage system. In this same vein, anything solid that doesn’t break down in the water is a no go. This includes chemical wipes, paper towels, and even dental floss. Hopefully, regularly flushing full meals isn’t a common practice. That said, it isn’t unheard of for people to scrape leftover scraps down the toilet. This is a bad idea for the same reason you don’t want to flush cotton products. Additionally, oils, grease, and other seemingly liquid food products are still problematic. Animal grease and fats don’t stay liquid forever, and when they congeal, they can clog pipes just as effectively as glue. Scraps are better disposed of in the garbage (they biodegrade just fine), and grease and oils should be collected in a sealable container that can also be added to the garbage. So far we have discussed things that clog and ruin drainage and sewer systems. Medication usually presents a different problem. If it’s made to be absorbed by your body, you can bet that it dissolves just fine, but this is actually a problem in this case. Because medications dissolve so finely, they become virtually unfilterable. This means anything you flush stays in that water perpetually. Many cities directly recycle their wastewater back into potable supplies. Even if this isn’t the case, the treated wastewater will be returned to nature, and it will end up back in the water table, rivers, and lakes. Safe ways to get rid of medicine can be found here. Even if you don’t flush these taboos frequently enough to damage your home plumbing, you can still contribute to a larger problem. Cities are regularly spending hundreds of thousands of dollars every year to deal with extensive clogging. Protect yourself and your community by committing to use the toilet responsibly.